Ian Whitelaw - Master Bagpiper for Weddings, Funerals, Performances, Teaching, Instruction, and all occasions. Ian is the perfect choice to teach this amazing instrument. (Click for testimonials.) With 30 years of teaching experience to his credit he has brought individuals into the piping world helping them achieve their personal goals and individual potential. Two of his own personal mentors were Andrew Wright, the President of the Classical Music Society in Scotland—a living Mozart—and Bob Nicol, the Piper to King George of Scotland. Ian combines their legendary gifts of musical interpretation and style with his own unique and incredibly successful expression and presentation of this instrument, the most intriguing of the woodwinds. Choose among the best of teachers for private lessons—choose Ian Whitelaw. Andrew Wright presenting Ian with The Banner of the Mountains (Ian's fifth) in Couer d' Alene, Idaho. 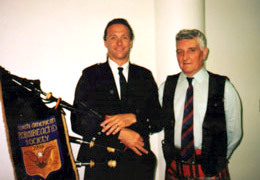 Ian's extensive credentials include membership with the Western United States Pipe Band Association advisory committee and the Highland Society of Piobaireachd ("peebrock") in Scotland. Piobaireachd is the classical music of the Great Highland Bagpipe. In addition he has certification as a senior judge in the Pipe Band Association. He is available to offer lessons for all students of any age and level of ability. Master Bagpiper for Weddings, Funerals, Performances, Teaching, Instruction, and all occasions.